I have a confession . . . I’ve been suffering from water-oven envy for several years. 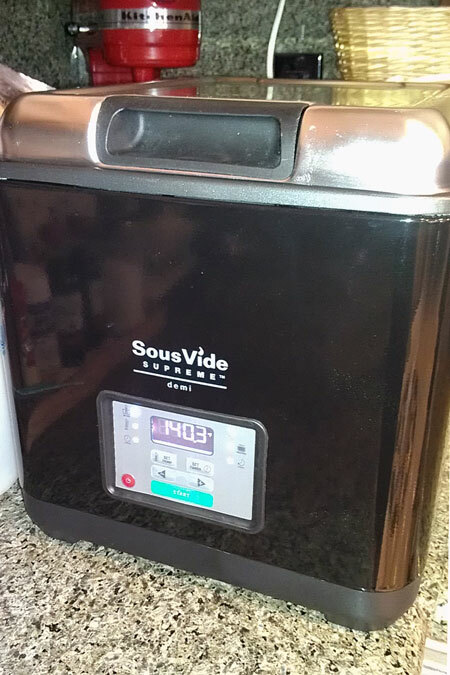 As an enthusiastic home cook and nationally ranked BBQ pitmaster with 27 Grand Championships, California and Arizona Team of the Year awards, 1st place national Kansas City Barbecue Society awards in chicken, sirloin, and 75+ first places, I’ve been hankering to dabble in Sous Vide (pronounced ‘soo-vee’) cooking ever since I heard about it in my travels around the world. 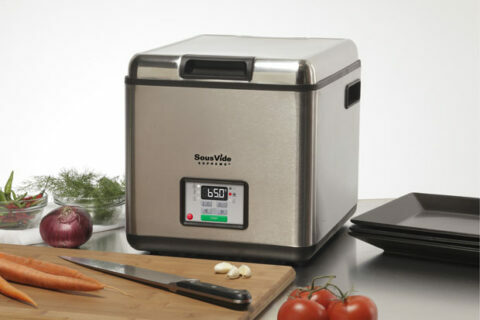 I was very excited when Elaine LaPersonerie from SousVideSupreme.com contacted me to see if I was interested to try their Sous Vide water oven. Are you kidding me? Of course I would! 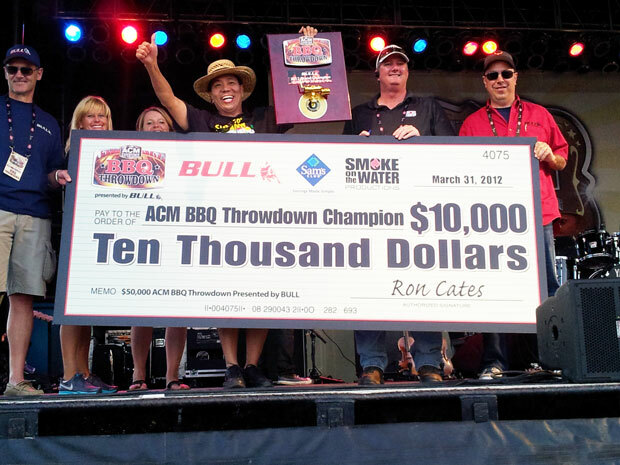 I couldn’t turn down a cooker with the same sounding name as my last name! Sous vide cooking involves vacuum packing meats and vegetables into a plastic pouch and cooking it in a precisely controlled warm water bath for several hours. Since I’m already a low-and-slow Dilberteque IT barbecue guy, I’m fascinated about the prospect of low and slow cooking whether it’s in my smoky barbecue pit or a scientific looking water bath so long as the end results are fantastic. I know what you are thinking? Why the heck would anyone want to cook food in a hot water bath? 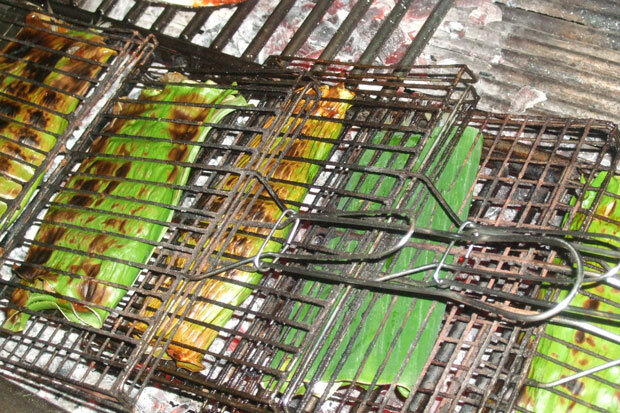 Well, the idea of cooking meat and vegetables in sealed containers goes back several thousand years from chicken wrapped in parchment paper (French poulet-en-papillote), fish wrapped in banana leaves (Malaysian Otak-otak), meat packed in salt or fat, or stuffed inside animal bladders (e.g. Scottish Haggis) before being roasted or boiled. Legend has it that ground zero of its recent popularity traces back to 1985 when acclaimed French chef Joel Robuchon, one of the best Michelin chefs in the world, served an exquisite dinner on board a bullet train while whizzing across the picturesque French countryside in a luxury dining car. None of the food served was cooked on the train but prepared days before and reheated in the cramped kitchen of the dining car. Amazingly, the meal was reheated sous vide food! There was no compromise in flavor and texture. Since then the French term “Sous Vide” cooking has spread far and wide across the globe as Robuchon’s exploits became well known. One of the main advantages in vacuum sealing ingredients a plastic bag before dunking in a precise temperature controlled water bath is the control the cook has over the flavor and texture of the cooked food. Overcooking and undercooking is eliminated completely. If you’ve ever grilled a steak, you’ll notice that is really difficult to get the entire inside of the steak to a perfect medium rare as the meat closer to the surface will overcook before the center is at 135 degrees. Well, with a water oven, you can cook the entire steak uniformly until it is pink-perfect 135 degrees from edge to edge. Moreover, the steak can stay in the water bath for hours and not lose its texture and flavor. If you decide to freeze the cooked steak, you can reheat it back to perfection. The additional step you have to take with a sous vide steak is to char the surface which you can accomplish via a fry pan, grill, or blow torch. If you’re like me, I never miss an opportunity to feel omnipotent by firing up my crème brûlée blow torch! Plugged in and ready to rock and roll! 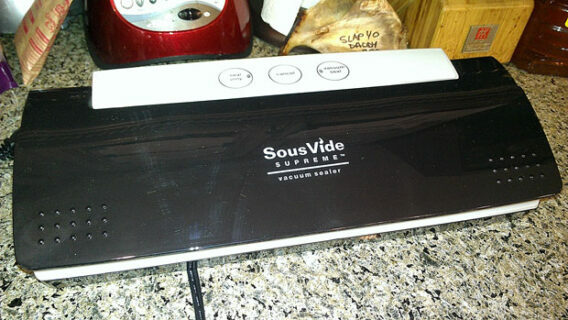 My loaner Sous Vide Supreme was shipped with a SVS vacuum sealer with extra food grade quart and gallon pouches. There was a short DVD and a recipe book outlining the 4-step process: Season, Seal, Simmer, Serve. Setup was super easy like plugging in a Crockpot. Just add water, turn it on, and set the temperature. Prepare your meat or vegetables, put into the pouch, seal, set the temp and time, and start. Between crisscrossing the country on teaching gigs and competition (Memphis, Pennsylvania, Salt Lake City, Hawaii, Malaysia, London, etc. ), I’ve been able to put my loaner Sous Vide Supreme water oven through its paces. Overall, I’ve been thrilled and amazed by the melt-in-the-mouth tenderness and flavor of the meat, seafood, vegetables, and even eggs cooked in the water bath. I’ve been a happy mad-scientist in my kitchen laboratory and will be sharing my sous vide adventures with you in the coming weeks. The first installment is my SYD Ultimate Sous Vide cheeseburger which contains beef fat I saved from my recent story about my Wagyu A-5 brisket. Stay tuned!